On Monday I wrote about the uncomfortable necessity for authors in today’s context to be serious about self-marketing if they have any hope of getting their message out. I appreciate how well that was received, as well as the multitude of you that have helped re-circulate the image quotes that the marketing team came up with for me. Now onto the next big tension that I’ve consistently felt along the publishing path: the craziness of Christian celebrity culture. And more specifically, the craziness of celebrity pastor culture. There is no universally agreed upon definition for this phrase “celebrity pastor culture,” but it feels easy enough to recognize. It is a result of the clear anointing/elevation of certain pastors and leaders within the Christian sub-culture. They become the icons of our faith, and are asked to sit upon a very public pedestal. They are the ones we analyze, dissect, emulate and copy. When they talk – whether by sermon, blog, interview, or tweet – we listen. Their words carry disproportionate influence and power. They are easy to spot, and we could probably rattle off their names with little effort. 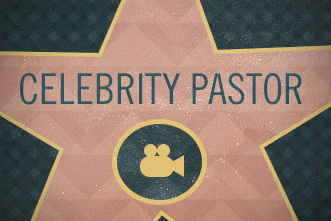 There are a variety of factors that go into the creation of a celebrity pastor. Many times the pastors themselves are complicit. But that’s not always the case. Their ascension into the public eye is often a direct result of our creation. We (and by ‘we,’ I mean all of us, as a collective crowd) have certain attributes that we value highly in our leaders. Usually they are the qualities that feel untouchable, or larger than life. We love big, and fancy, and opulent, and spectacular. Therefore, we often assign near magical qualities to the leader or preacher or pastor who seems to produce these results with ease. This dynamic feels particularly fresh in my mind right now. Over the last few weeks at River City I preached on the life of David. I covered a lot in the series, but there was one verse that hasn’t left my mind. It’s a familiar one to many, but maybe it’s too familiar. The stinging nature of its truthfulness is unavoidable. You may have heard that verse a thousand times, but take a moment to let it really sink in. It is an important reminder that without the supernatural transformation that comes from a renewed mind in Christ, we are consistenly drawn to the superficial and spectacular. Our native instinct is to look at the outward appearance, and to then derive value and worth from that. Image, money, possessions, status, upward mobility – these are the default measures of worth. Left to our own devices, we will always notice the outward appearance over the inner. But in as stark of a contrast as can be drawn, this text says that “the Lord looks at the heart.” Those external qualities that we ascribe so much value too mean almost nothing in the economy of God. What catches the attention of God is an entirely different list of virtues. It is the qualities that create character: integrity, humility, dependence, servanthood, nobility, etc. This is a poignant summary of what is so wrong with the Christian celebrity culture at large, and the pastor celebrity culture within that. In the passage read above, Samuel was tempted to over-value superficial, outward qualities when searching for greatness, and we are no different. When we compile our list of celebrity pastors, we find an eery similarity to that which Samuel was initially on the hunt for. We are looking for the outwardly impressive leaders.. the ones who do spectacular things that take our breath away. Isn’t that the common denominator amongst all of the celebrity pastors? In our day and age, greatness can almost always be equated with BIG. Our celebrity pastors have big churches, big buildings, big budgets, big staffs, big conversion rates, big gatherings, big baptism numbers, etc. Is there anything fundamentally wrong with big? Of course not. That would completely miss the point. The dark side of celebrity pastor culture is that the criteria by which we tend to elevate leaders to pedestals is based almost exclusively on outward appearance. Some of them are undoubtedly great leaders that are worth following. But the fact that we use such a shallow form of evaluation leads to an inevitable conclusion. Many of the leaders we highly esteem are probably not on their pedestal because God put them there. They are there because we did. This one statement alone should probably be broadcast as a public service announcement… yeah, I’m old enough to remember them. I would hope that your point would be well taken by the masses but I feel instead that that it will only be considered by the faithful few. There is a problem with the Body of Christ at large. One that has been years in the making, although foretold so many years ago. Many have thrust to the forefront those who embody the personal lusts of their desires. While we can’t be those leaders, as some have decided, we seem to take great comfort in living through them. I pray that more would be vocal as you are now. This posture, if continued, will call for another “Great Awakening.” Sadly, it may very well be the time for it. I applaud your courage to speak the hard truth on this matter. In any event… continue to fight the good fight. Thank you so much for the thoughtful comments!